Clark’s College had two sites; one in Dyke Road and the other in the Old Steine on the east side. This building had a plaque on the front wall commemorating the fact that Algernon Gideon Mantell (1790-1852), had lived in the house. The Old Steine site was for business studies such as shorthand, typing and book keeping while the Dyke Road site catered for general education subjects. The college was co-educational on both sites. Every Wednesday afternoon was for sports and we played cricket in the summer, and football in the winter on the fields just north of Preston village. We also played on the site on the west side of the London Road in Preston. If you have any class photographs you would like to share on the website, please contact jennifer@mybrightonandhove.org.uk. If you have any memories of the college you can share, please leave a comment below. You can visit the Old Clarkonian Association website here. Just a few points to add to the above. When the school closed down the house in the Old Steine became an hotel (I think it was called Cook’s Hotel) with the basement area knocked through to the back and dances were held there, (Bevendean Hospital used it for their annual Christmas dances). Also the front ground floor room that had been the typewriting training room became a bar. One point about the typewriting lessons is that in order to teach real touch typing, and the machines used were the upright L. C. Smith ones, every key, that is letters, numbers and punctuation marks were covered in a plain black disc so when sitting down in front of them for the first time you had no idea of what each one was. Then to top it all on the last lesson of the each week on Friday, you were given a test which you had to perform in time to the beat of a record. But to make it even more of a test and to stop you looking down at your hands (and you may not believe this but anyone who had these lessons will confirm) you were blindfolded. Happy days! Still even now over 50 years on I still am able to touch type on the pc, amazing to think that the qwerty key board has stood the test of time. I was at Clarks College from 1958 to 1963 although I cannot remember any premises at Old Steine. I have a school photo taken of myself in 1962. I was a pupil at Dyke Road from 1949 till 1953. My best friend was Barbara Martin. I have many fond memories of my time there. Miss Minea, the secretary and games mistress, taking us for tennis at the Rockery, Preston Park and netball at Moulscombe. Mr Jenkins who turned a blind eye if we were late back from lunch (often having been to the Princes News Theatre and seen “Flash Gordon “). How we would laugh if we saw those “scary” films now! I have fond memories of all the teachers and my time there, so long ago. My brother David Hardy attended Clarke College in the 60s. Did anyone know him? 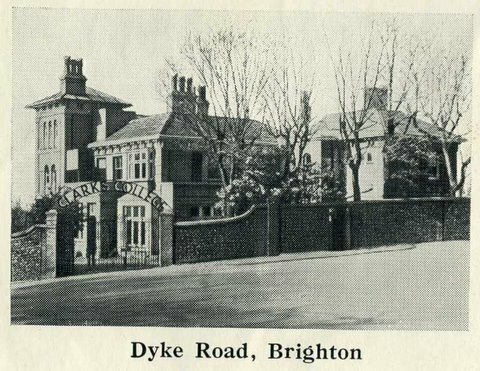 My parents both attended Clark’s College in Dyke Road, Brighton, between 1921 and 1924. They fell in love there, but didn’t marry until 1932. In the meantime they both got good very jobs in London after leaving the college. They kept in touch with each other and also with all the very close friends they made. Yesterday my elder brother found in his loft, a little hand-painted and hand-written card to my mother in 1924, from a friend called Barbara Greene. Inside this card, Barbara had listed all their “best friends” and “enemies” at Clark’s, including a group of people they called “The Preston Park Gang” (just 5 of them) - and also the boys they fancied, with all their nicknames. There are 43 names in total on this list! An example of one of the names (a friend) is “Pimple Costello”! I found all this highly amusing. The elegant building in Dyke Road is still there today. It is now The Alternative Centre for Education, Behaviour Support Service, at 43 Dyke Road, Brighton, on the corner of Clifton Terrace. I studied at Dyke Road from 1972 until 1974 when two sisters, the Miss Bishops, ran the school, they were two of the happiest years of my life and I would love to hear from anyone else who studied there at that time. Yes I went to Clarks in Dyke Road, starting in 1959. At that time it was one of the best known independant private schools in the UK. Morris Farncombe was deputy and the Head Master passed away soon after I started. Mr Farncombe was overlooked and a Major Firth became Headmaster. To say you went to school at Clarks was often enough to get you any job you wanted. I was a student at Dyke Road branch (Clifton Terrace) from 1950 to 54, then at No 61 from 54-55. After being previously at an all boys’ school, Clark’s, being co-ed with no corporal punishment, was a breath of fresh air. Messrs Wakefield and Bubelik were my favourite teachers, but Miss Bishop was a most conscientious lady, helpful with all students experiencing difficulties. Mr Barnard was deemed eccentric, and Mr Jenkins a bit bumbling but kindly. An annual highlight was a visit to the Old Vic in London, to see ‘Twelfth Night’ starring Richard Burton and Claire Bloom, being especially memorable. Happy days! The “Cooks Hotel” in the Old Steine was used by a boarding school in Preston Road (Preston College) during the 1950s of each December before the end of term. We had the annual Christmas dinner and dance in the basement there, before some of us were packed off home. I remember it well, as it was the only decent grub we ever had. I attended Clarks College at both sites in Dyke Road from 1955-1961 and remember well the good time spent there. I believe the head master was Mr Hart during this time. I look forward to hearing from anyone else who was there at this time. .
Hi Susan, did you live in the Florence Road area in the early 1960s? I attended Clarks College 1955 to 1959, so good to read all the memories: Mr Hart and geography homework on Friday, Mr Jenkins and Tots and Mental, the handwriting competitions. I remember Byan Gumbley who has written a note well. Two other names that I met up with later were Chris Rahn and Steve Lacher. The bald headed gentleman was a Maurice Farncombe. I taught at Clark’s College from 1962 to 1966. Mr Firth was headmaster. They were happy years. I have a photograph of me sitting with the senior class. It rests on my bookshelf. It was nice to read that David Weetman had seen my clip on attending Clarks College back in the 1950s/60s. I remember him as well. We both married Seaford girls. I no longer live in the area but am still married to the same girl, 50 years on. Nice to hear of you David. I was a child actor and in 1951 I appeared at the Theatre Royal in Brighton. As I was free during the day I was sent to Clark’s College for a few weeks and I remember making a thermometer in the Science class which was all very new to me. I lived in Kingsbury at the time with my parents and sister and attended the Aida Foster School for Dancing and Drama along with Barbara Windsor, Shirley Eaton and others. I am now 78 and live in Toronto, Canada. I was at Clark’s College at the same time as David Wheatley and Bryan Gumbley and very many more. Some of us used to go the the Princes News Theatre and ice skating rink sometimes during our lunch hour and sometimes on a Thursday when my parents’ dress shop in North St. had half day closing, a group of us sometimes played in the shop that I used to live above. I have a reasonable memory of some of the teachers but, being one of the girls, I believe most of us girls missed out on much of our general education when encouraged to enter the secretarial section of the College instead of studying for GCEs. Also remembering classmates to name but a few – little Johnny Pickard, Richard Brooks, Carole Scrivener, Bill Ormiston, Stephen Lockyer from the USA, a young Prince Saba from Kuwait, a couple of the girls who were badly teased or bullied (sad to think about that today), the late Jane Hutton-Burgwin who died young, Fraser Gouldson getting into trouble with Mr. Greville who tried to teach French before disappearing one day never to return, Mr. Wakefield the PE teacher. I was at Clarks College in Brighton between 1953 and 1959. I remember a lovely girl, Miss Shirley Fee, in my class, approx 1947. I remember you Brian Hill and I thought you were going to end up in the RAF and strangely enough I married an RAF pilot. I also remember Eddie Whaley and Christina Gregg. I also remember Mr Greville .One day some empty wine bottles were put on his desk and I think it was too humiliating for him and that was the last time I ever saw him. I was upset for him and didn’t know which students were responsible but it was because he seemed to be tipsy sometimes. I did a year’s secretarial course at Clarks college in 1962 when Major Firth was the headmaster and there were several girls in my class whose names I remember -Zena Lane, and Somphorn Vongschanpen, Sif Adelstainsdottir and Poudpong Sahachaiserie . Hello to Loretta Blank who I remember from my early schooldays at Windlesham Kindergarten in 1949/50 who has left some comments about her time at Clarks College. It was nice to see Father Anthony Clavier commenting on his time at Clark’s College. I’ll never forget the kindness he showed to me and my two brothers when my mother passed away in February 1965. Hello to my old class mates of Clark’s College. Again remembering Brian Gumbley and David Wheatley who have written above. Also remember Steve Lakier (thought it was Lockier), Richard Brooks, Bill Ormiston, of course some of the girls – Sandra Stuart from Secretarial, Suzanne Parnes, Carole Scrivener. What happened to you all? You can message me via Facebook under Loretta Ankier. Another hello is to Christine Morton Cameron I can see above. Christine, it was not Windlesham Kindergarten, it was Brighton and Hove High School. I remember you - a year or two above me, I was a border. Now live in Greater London; keeping well and fit and playing badminton several times a week.